I just got off the phone with our new Superintendent, as put out on the UP Portal the Little Rock Service Unit has been renamed the Mid America Service Unit, Like wise the KC Service Unit is now the Heartland Service Unit. The Mid America Service Unit extends west to Jefferson City but does not include the yard, So Moreau is the line between Heartland and Mid America. Mike Prince will be the Senior MOP that will be over our "district". Mr. Bybee informed me as well that he will be on our "district" every other week unless he has obligations in Omaha. He referenced there will be multiple districts within the Service Unit to allow for individualized operations and practices. As more of this unfolds I will pass out the information, stay tuned. If you are working as an Engineer on November 15, 2018 your vacation will be scheduled as an Engineer. You will need to turn in a vacation request to the BLET. The BLET only accepts vacation request in writing, either email a BLET Local Chairman or use the vacation request form and deposit in a division mailbox. NO REQUEST PLACED INTO CMTS WILL BE ACCEPTED. The Carrier is putting out instructions to their mangers to put anyone late for work in no-show status. I know over time I have seen crew members go from showing up 30 minutes early to showing up 30 minutes late. It is incumbent on us as Union Representatives to make sure we inform our Members that the Carrier expects them to show up no later than their call time. I believe this is the first step we are seeing of the precision railroading. I completely understand that there are times unexpected problems arise, including but not limited to, mechanical problems, accidents, etc. If our Members are chronically late we are going to have a hard time representing them on discipline. We need our Members to be aware of this expectation and to thoroughly document any reason for their inability to be on time for work. I am afraid this is going to get ugly if we can't get our Members to show up on time ready to start their assignment. I would suggest everyone have their assigned manager's phone number to call if they are having issues getting to work. We have a conference call set up with the other BLET General Chairmen to discuss this problem to search for some solution. I don't think the Carrier has the right to pull someone off their assignment and place them in no-show status for being 1 minute late because I would view that as discipline without an investigation. However, as I understand the instructions to the field managers they intend to do just that. Help us get out the word. Kyle and I have been receiving calls from some of our Local Chairmen concerning agreement changes with regard to the UP precision railroading and the restructuring of their regions and service units. The UP organizational changes do not in any way affect our MOP Upper Lines CBA. Any rumors you hear that say otherwise are not true. Some of you will belong to different service units due to this restructuring. I will attach the newly realigned map of the UP Service Units and Regions. As you can see there are now only 2 regions and fewer service units. We have not been given the names of all the new superintendents but we do know that Jerry Everett is no longer the Superintendent of the Little Rock Service Unit, he has been moved out West. On Monday several UP Company Officers were fired and/or forced to retire as the UP continues to follow the "Hunter Harrison Model" to reduce their expenses. As information comes in regarding the restructuring of personnel we will keep you informed. Just make sure our Members understand that our agreements are all intact. Read more about Message from the G.C. As of 7:15 this morning the St. Louis Service Unit is being dissolved. As more information comes to me, I will let you know. This is a management change, this no way changes our agreements or seniority district. Did you know that when riding a locomotive over a crossing you cannot be on the steps. This means you must be all of the way up on the platform, not just off of the bottom step. 81.7 B - Details when not to ride. The second to last last bullet covers riding overs crossings. The first part of the sentence says not to ride over a crossing on the sill step of equipment, the next part says engine steps. Notice that this does not state bottom step. Also, it is important to understand that this applies to any crossing, including those in the yard. Another question that often comes up is when do I have to be on the ground and when can I ride across a crossing? 6.32.1 Details when to provide warning when shoving over a crossing. The rule is specifically titled CARS Shoved, or Kicked, or Dropped. The rules specifically states “cars” and does not apply to locomotives. Also, this rule applies to all crossings; public, private, field, and yard crossings. The exception is crossings used exclusively by railroad employees. If in doubt, be in the ground. If shoving cars over a crossing, you must be on the ground to provide warning. If the crossing has gates, you can ride across but you cannot be on the sill step. If you are riding a locomotive you can ride across any crossing but not on any of the steps. You must be all of the way up on the platform. If you have a crossing protection order that requires you to be on the ground to provide warning, then you must be on the ground regardless of the crossing type, locomotive or car. Twice in my career I have had someone run into to side of my cut of cars while switching. Once, one of my coworkers was knocked of a car that was struck as he was riding a shove over a crossing. Had he been on the sill step, he would’ve undoubtedly been crushed. Non compliance with 81.7 is handled as a Critical Rule violation. It is important to understand and follow not just for rules compliance, but for your own personal safety as well. Airbrake and Train Handling rule 32.1.6 says that when releasing handbrakes, you must check 3 additional cars beyond the last one that was applied. 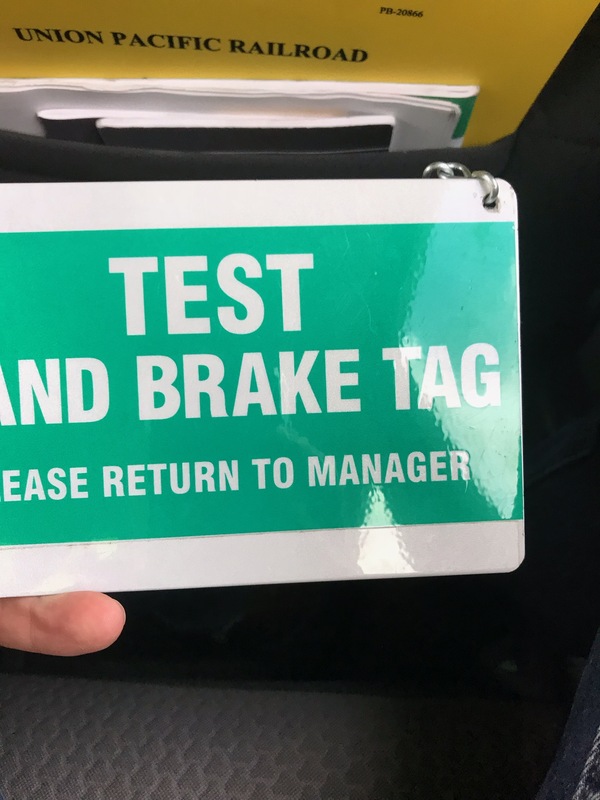 There has a been a rash of trains with handbrakes found on the head few cars, so there’s a new test Item that’s being introduced to check for compliance. Take the time to go back and check. I recommend even checking when the tie down sheet says that only the engines are tied down. The rule would also apply when you are stopped for a hot wheel and find a handbrake.